The big day had finally arrived. 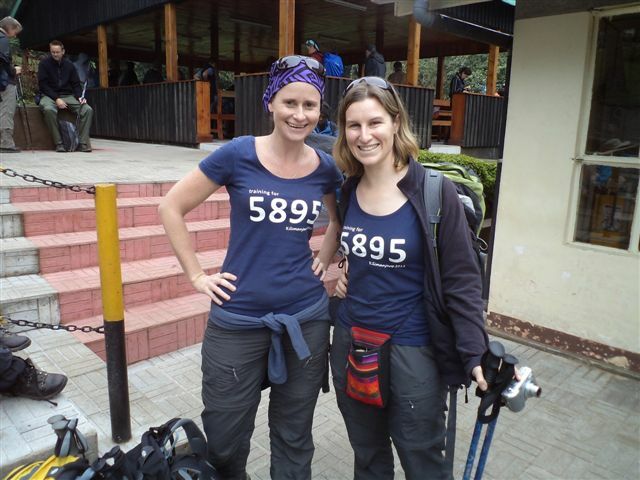 This was the day that Donna and I were to begin our epic journey to reach the summit of Kilimanjaro. I awoke long before the alarm sounded but I lay there with so many thoughts running through my head. I thought of Emma and smiled as I thought of memories we shared and I longed to have her with me to share this with her too but I knew she was with me in spirit. I thought of all my friends and family all over the world who were thinking of me as this day dawned. I made mental notes of what I still had to pack into my bags. I lay there with a thousand thoughts whirling through my mind. I had envisioned this trip so many times, what it would be like, what it would feel like and now it was finally here. The alarm finally sounded and with no time to waste, excitement enveloped our room. 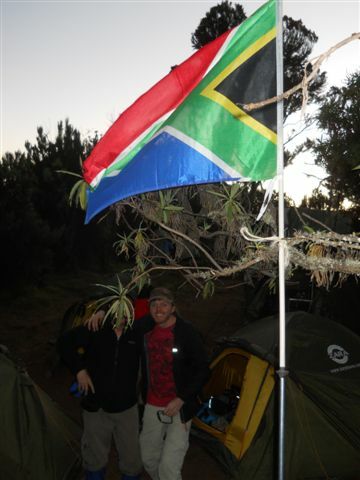 We took turns showering and then packing the last few odd items and filling up our rehydration packs with water. I had to “borrow” toilet paper rolls from Springlands Hotel because would you believe I had forgotten to pack such an essential item! I can picture my friend reading this and shaking her head ~ we go on the smallest of walks and she always has a roll of toilet paper packed. Luckily that seemed to be the only item I had forgotten to pack back in South Africa. At breakfast Thomas took our first reading of our blood oxygen levels and pulse with an oximeter. It’s a little black contraption that slips onto your figure and spits our digits in red telling us oxygen levels and pulse rates. 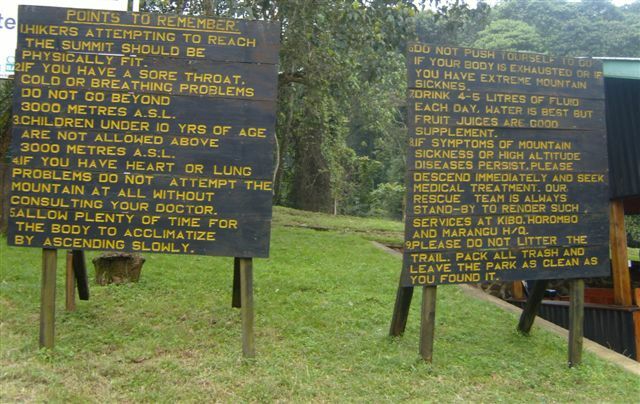 We would have this reading done every morning while on the mountain to ensure that we were still alive enough to continue! When it was my turn to stick my finger in, my heart was beating ridiculously fast. It’s like my body was getting all worked up in fear that I wouldn’t be okay to head out to the mountain. I was supposed to be “at rest” yet it felt like I had just run a marathon the way it was beating. I felt like everyone sitting around me could hear my heart beating…. The numbers popped up, 84 for pulse and 98 for my oxygen. 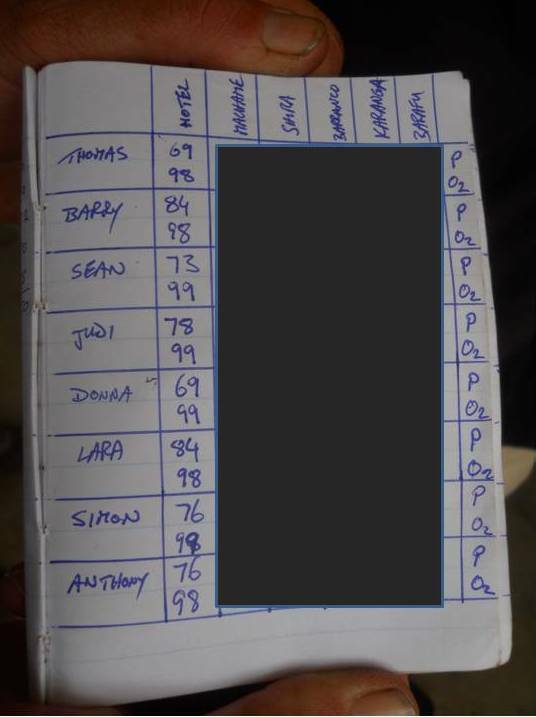 Thomas scribbled the numbers in the book and moved on to another team member. Looks like I passed the ‘test’ and was ready for the mountain. I am sure I no doubt sighed with relief! Our first pulse and oxygen readings for the trip. All alive and well, we all got the nod of approval for departure. After breakfast our bags were weighed, a sigh of relief from both Donna and I again as we were delighted to find out our bags were not going to break the backs of our porters, although yet again our bags appeared to be heavier than anyone else’s. 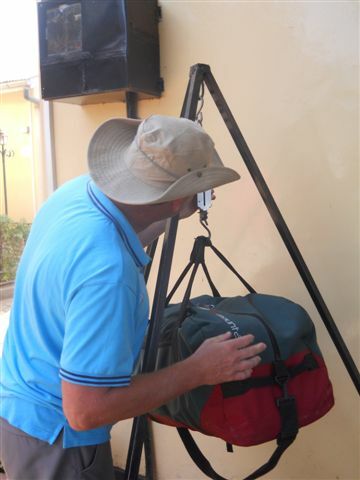 My bag on the scale, Thomas checking how much it weighed. I stood back, too scared to see if my bag was overweight or not. Our excess luggage was stored, passports and additional money was locked away in the safe. We were almost ready to go. We got news that Simon and Anthony (our airport pick-up’s) had arrived early that morning and were currently having some breakfast. Our bus pulled up and our bags were loaded. 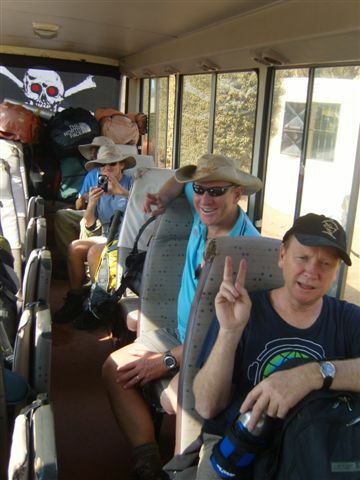 Bus loaded, it was time to go. Bags loaded. 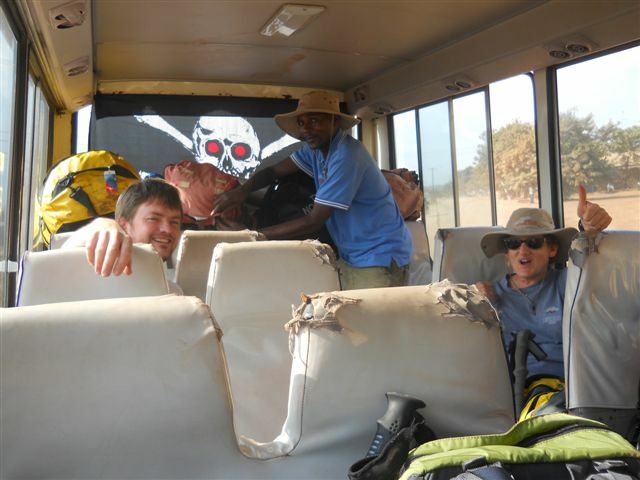 Team and guides safely on the bus ~ this was it, we were heading out back onto that bumpy dirt road and out to the slopes of Kilimanjaro! 8/7/2012 – Time unknown, probably between 8 and 9am. 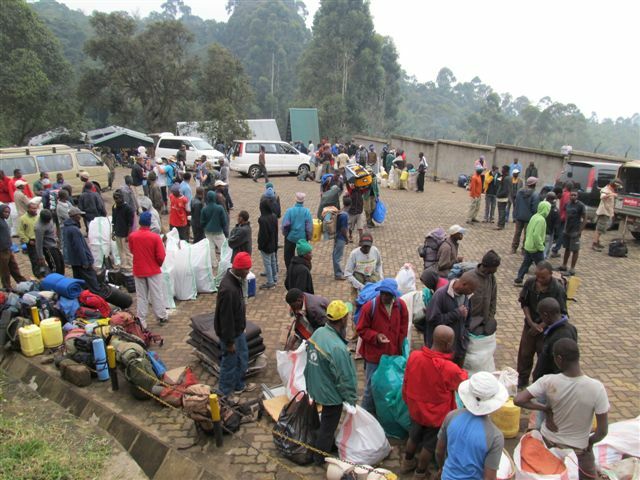 “Our bags are weighed, we are dressed the part and we are heading to the mountain. We saw the mountain for the 1st time yesterday ~ wow she is beautiful! Snow capped and positively HUGE!! So much bigger than in the pics and literally half way to the sky! 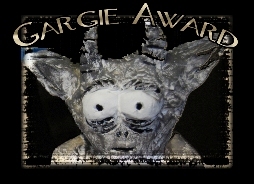 Feeling a little nervous but still hugely excited. Can’t wait to get walking! This is Day 1!! 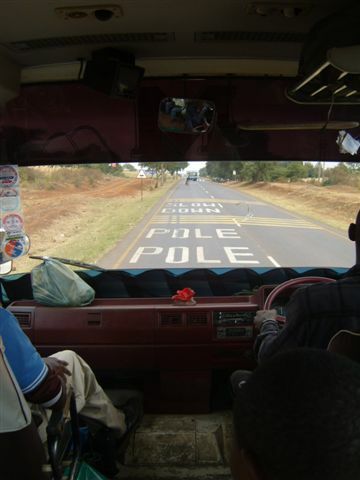 Pole Pole (Slowly Slowly)~ Words we would hear thousands of times over the next 7 days. 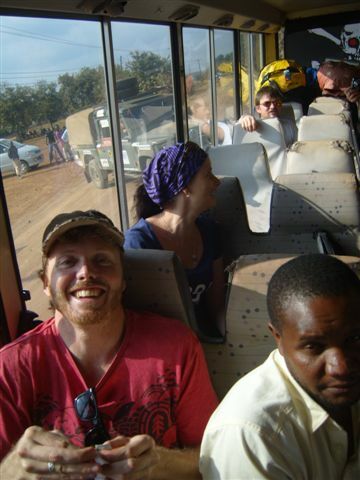 I don’t remember how long the bus ride took, excited chatter filled the bus, a couple of people closed their eyes. Maybe they had a restless night like me, maybe they were saying a quick prayer. I was excited to get going, I had waited a long time for this day. 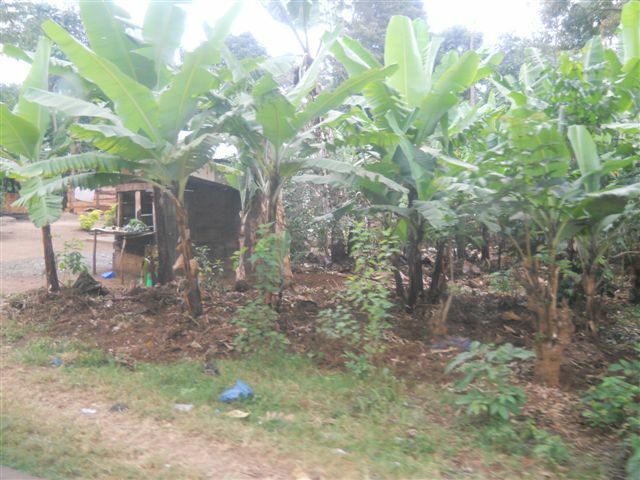 The scenery eventually began to change and we were driving through fertile banana and coffee plantations with the Machame village dotted in-between. 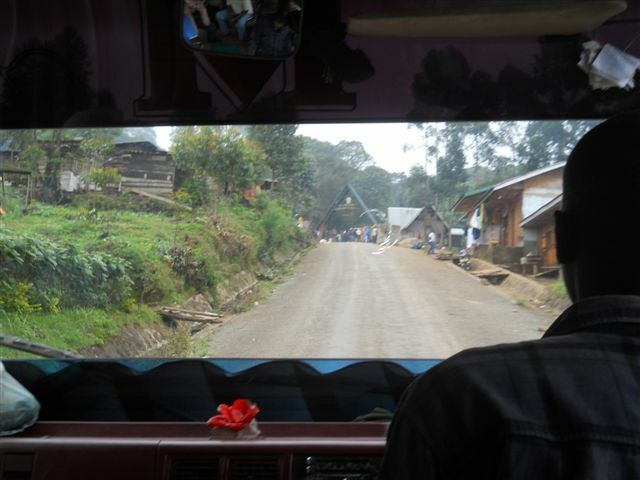 The Machame Village dotted between the banana and coffee plantations ~ we were getting close! 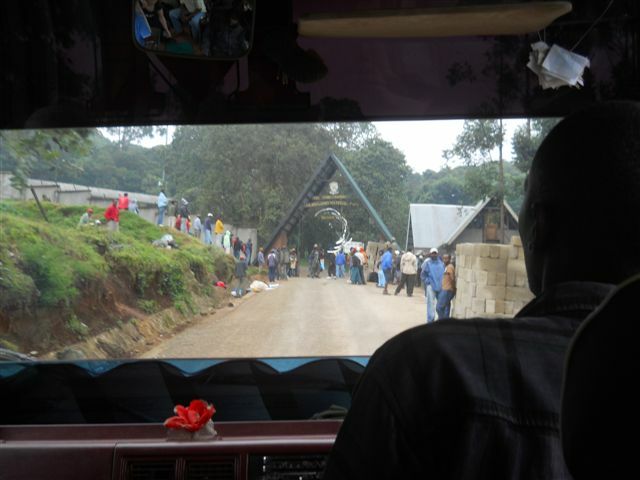 Up we climbed as the bus chugged along the tar road, I knew we were getting close and then we saw it ~ The Machame Gate. 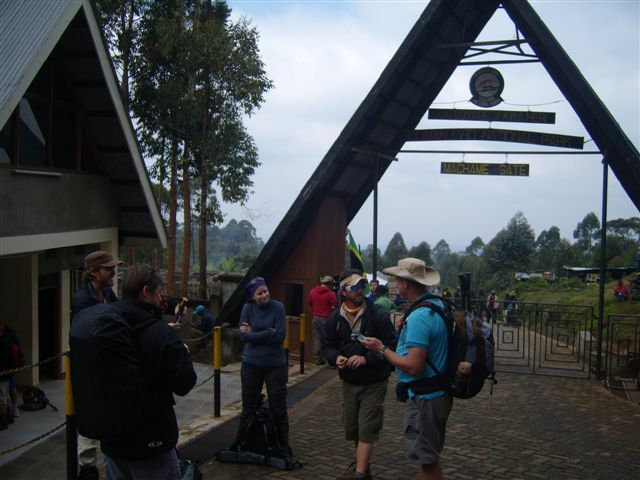 The gate was crowded with men bidding to sell walkers like us water, trekking poles, gaiters and anything you could possibly think off. 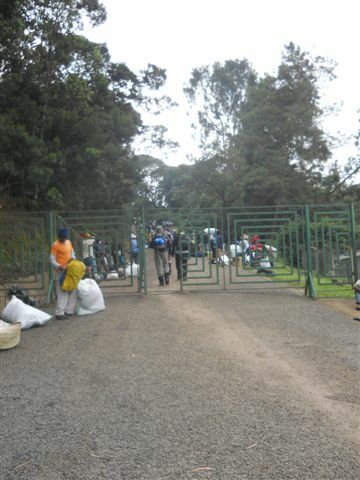 The gate was guarded by an armed man, only porters, guides and hikers were allowed past this point. 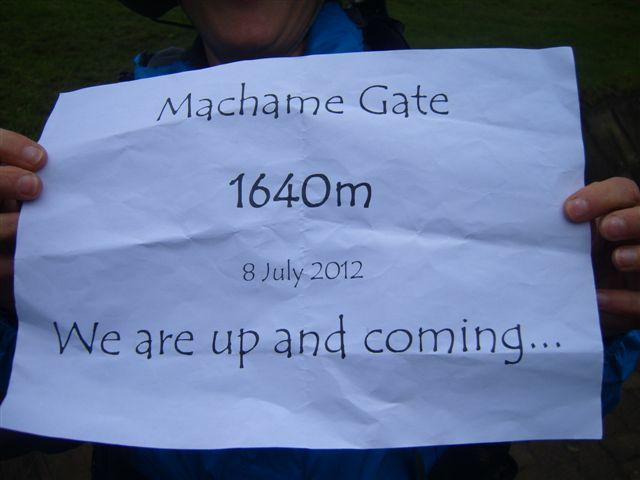 We rounded a corner and we got our first sighting of the Machame Gate up ahead in the distance. 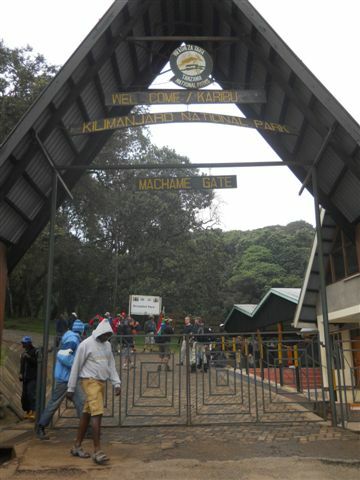 The Machame Gate ~ We were here! 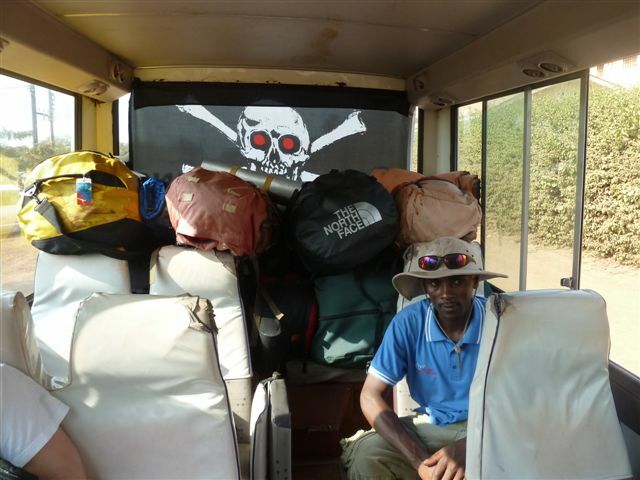 We piled out of the bus, leaving our bags for the porters and our lead guides to sort out. A lot of waiting followed, time elapsed, we signed in, stood around chatting, waited some more, took photo’s galore and waited some more. 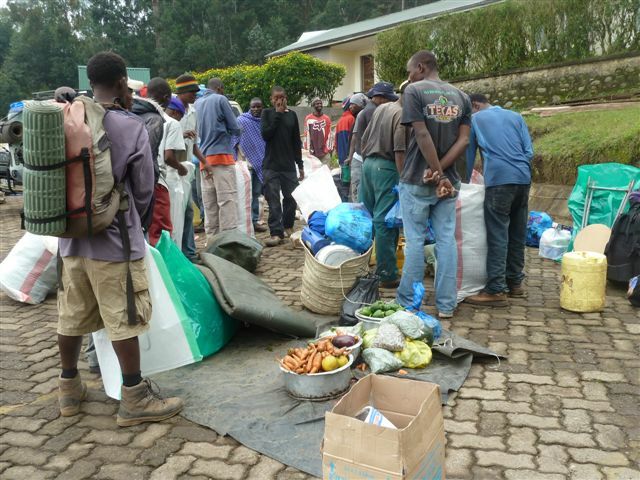 The porters were getting all our equipment ready and sorting out our food and gear to be carried up the mountain. 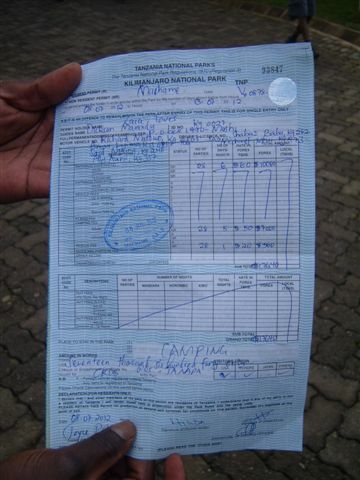 Our lead guides were sorting out our permits. We were on Africa time. We had arrived! 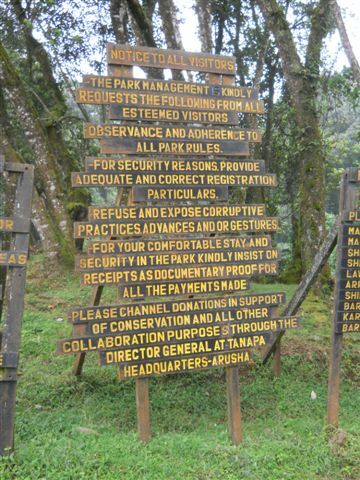 The do’s and don’ts ~ There was loads to read as we waited for our permits. Some more do’s and dont’s. Now we were getting to the good stuff! However, I think these times were porter walking times because we sure did walk pole pole. Some points to remember ~ Or was this in fact points to scare you…! 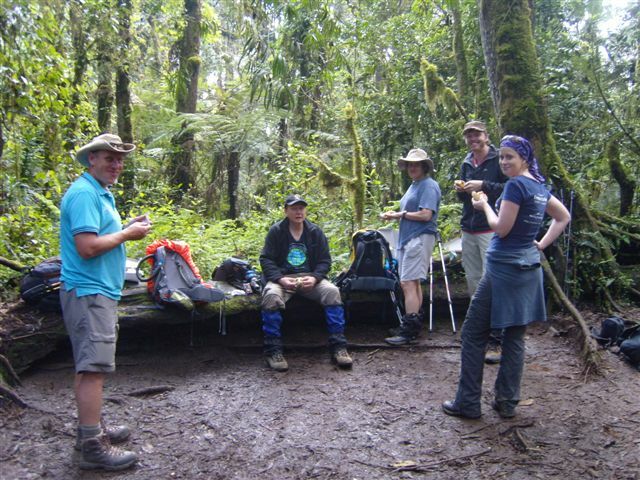 Our Team minus Barry again ~ From Left to Right: Judi, Simon, Anthony, Me, our chef Dawson, our lead Guide Dickson, Sean, Donna and Thomas. 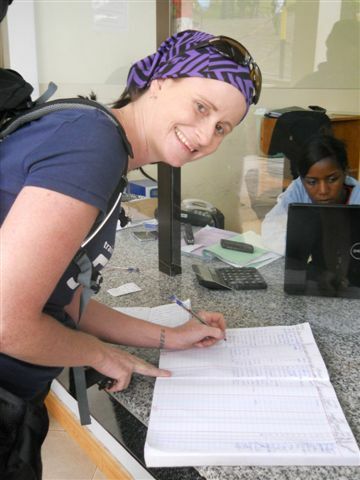 Finally we got called to sign in the register. 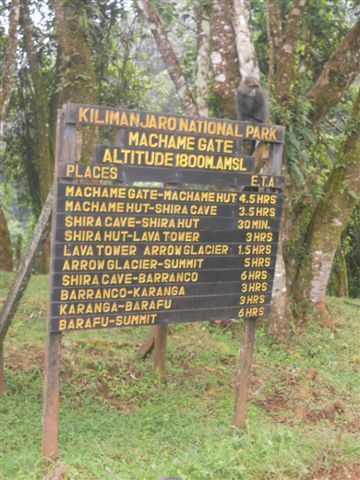 I had to keep reminding myself that I was signing in for Kilimanjaro. 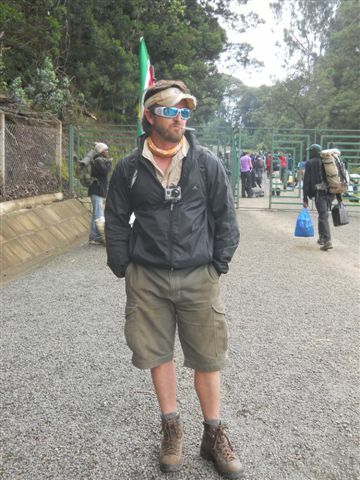 Not Fish River Canyon, not Otter Trail but finally the BIG one, I was signing in for Kilimanjaro. It felt very surreal, yet some how I knew I was really there. 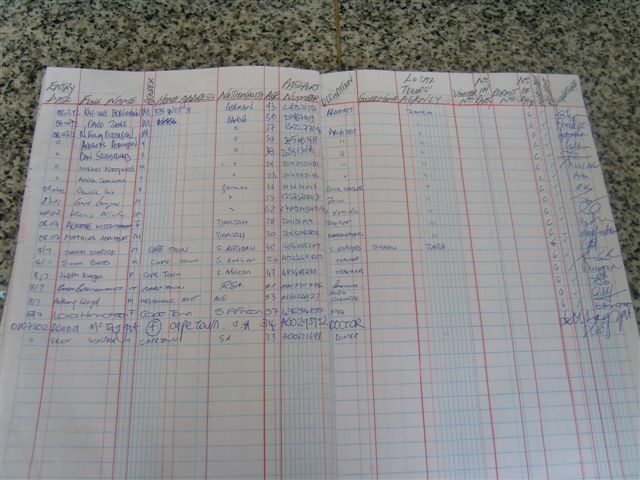 All my personal particulars were recorded in the parks register. It was official! Signing into the parks register ~ Making it all official! From Thomas to Sean our team was signed in and registered. Our team all together and all signed in, we waited some more. I don’t recall how long we waited or even what the time was when we did eventually leave. It all just seemed to mush into one. 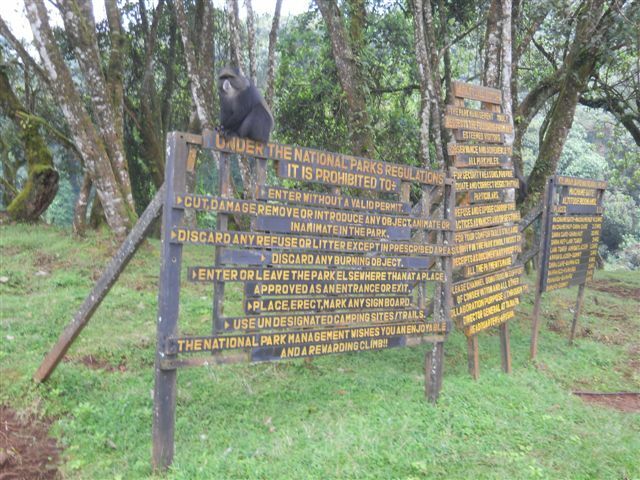 All we needed now was our permit and we were ready to head out onto the majestic slopes, which at that time we couldn’t see due to cloud cover but we knew she was there lying just beyond the trees and misty cloud. 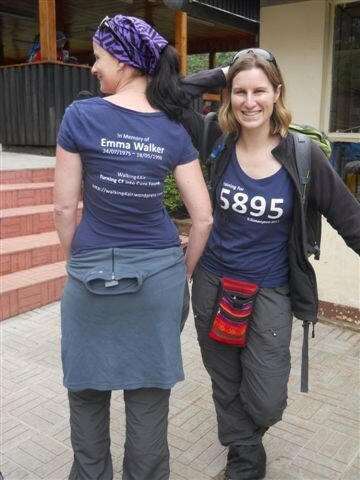 I was not only climbing a mountain, but I was climbing in memory of my best friend, Emma Walker. 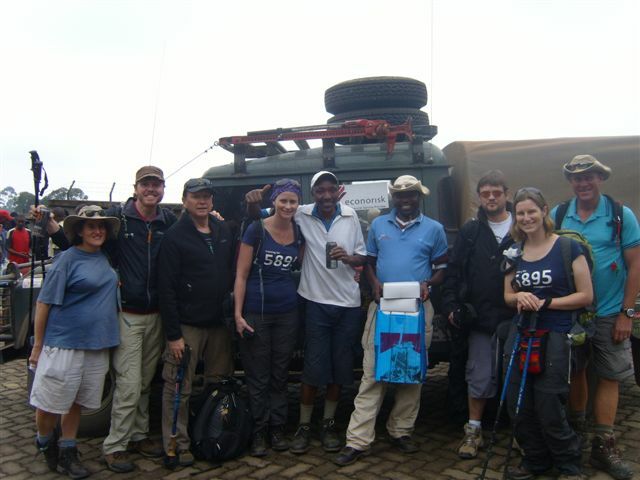 Waiting around allowed for plenty of photo opportunities ~ Here’s our team waiting to tackle the mountain! This was Day One. Donna and I so ready to get going! Finally, our lead guide, Dickson, appeared with our permit in hand. 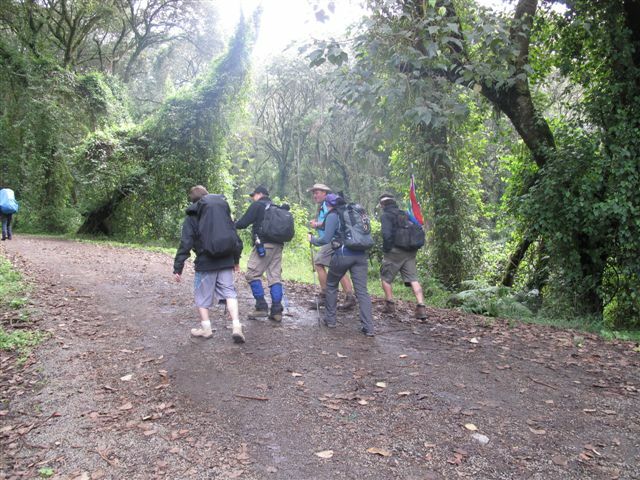 All the formalities complete, it was time to head into the forest and begin our ascent to the first camp on the mountain. Our permit in hand, we were ready to go! 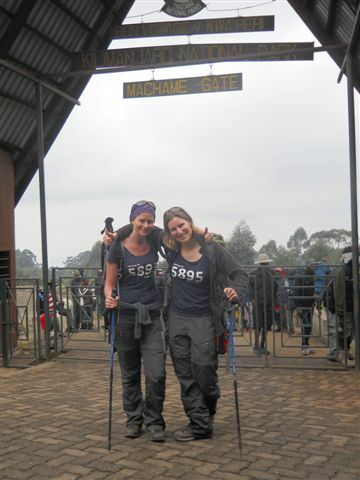 With our permit in hand, our day packs on and our trekking poles out we slowly started moving towards the gate. For me personally, my journey of a lifetime was just beginning…. Weighing in section for the porters. Hope my bag made it through this part! 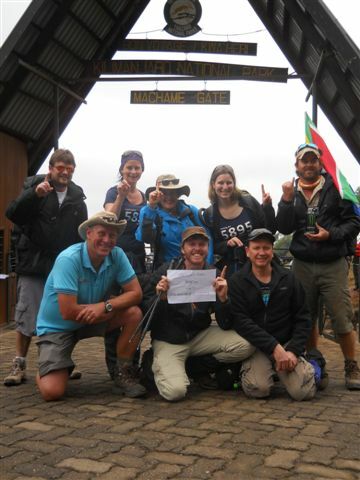 Our climb on Kilimanjaro had begun! The man in the middle of the road is our cook Dawson, dancing!! Someone was happy to be back on the mountain climbing (cooking) again! 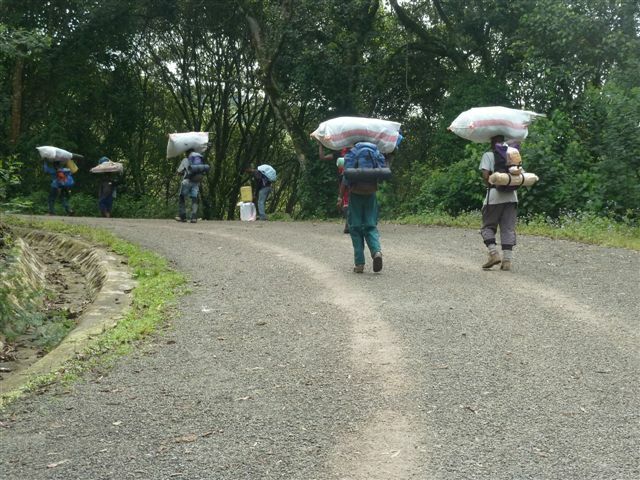 Porters carrying gear up. 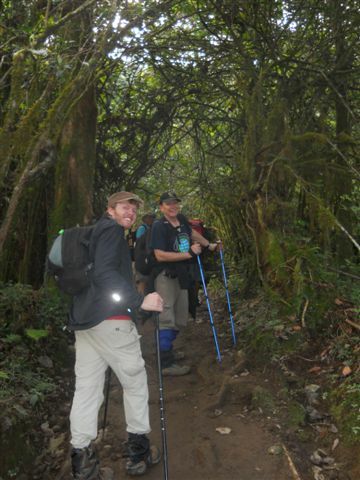 The porters amazed me every time they passed us. Walking quickly with huge loads balanced on their heads, neck and shoulders. 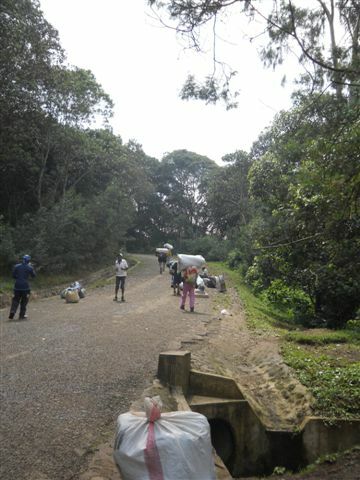 Without them carrying all our stuff, I would never have made it to the top! 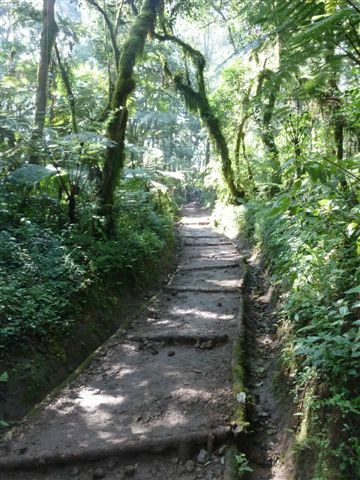 The first part of our walk was on a wide road, which was muddy in places but easy to walk on. 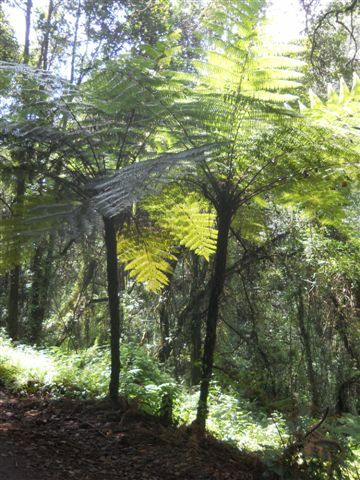 The forest around us was lush and beautiful and although the path was wet and a bit muddy at times, our walk was easy and the rain stayed away. 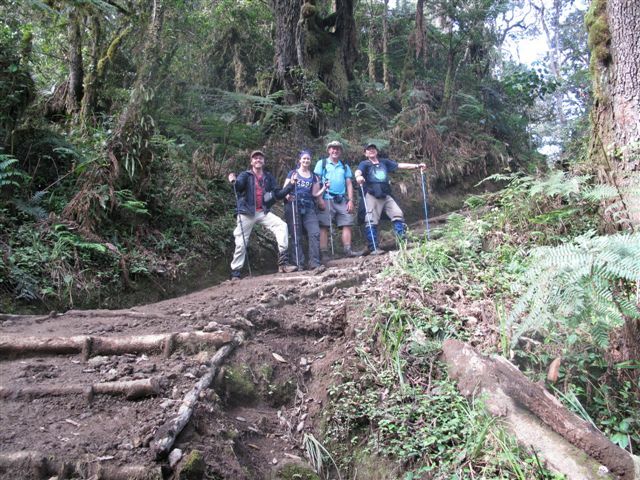 Within a short time, we found ourselves deep within the magnificent mountain rainforest. 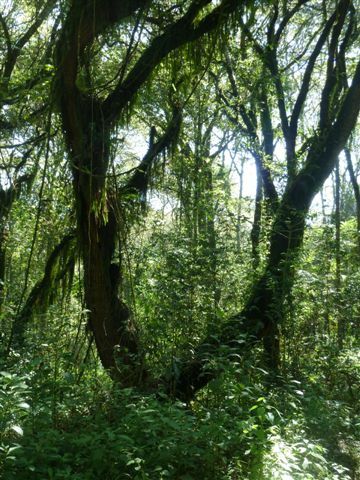 In the heart of the rain forest. Late in the afternoon we found a nice open spot for lunch. Sean and Barry, who were ahead of us, were meant to pick out a lunch spot and meet us there ~ maybe they weren’t hungry and decided to go on. A packed lunch was provided for us, a box filled with fruit and sandwiches, peanuts and biscuits and juice. Walking up front with the boys, Thomas stopped up ahead and gestured for us to take a look. 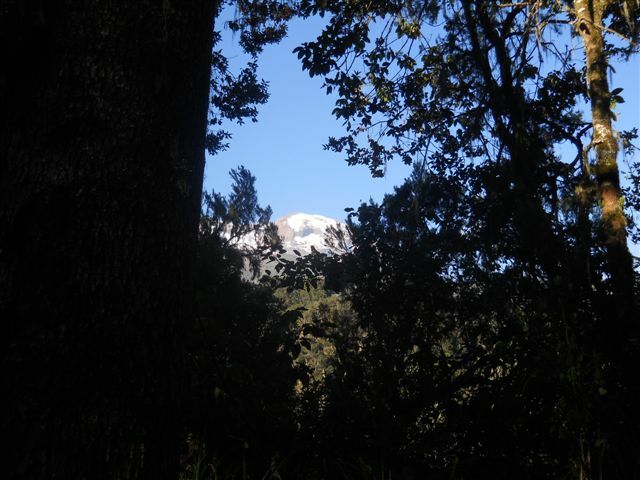 Another jaw dropping moment, there between the trees was where we would summit Kilimanjaro. She rose in solemn majesty, the eye not distracted by anything else around. Sighting the slopes of the summit between the trees for the first time. Indescribable moment! Sighting the slopes of the summit between the trees for the first time. Indescribable moment ~ There stood our final destination! I don’t recall how long we stood there, I just remember standing there staring. 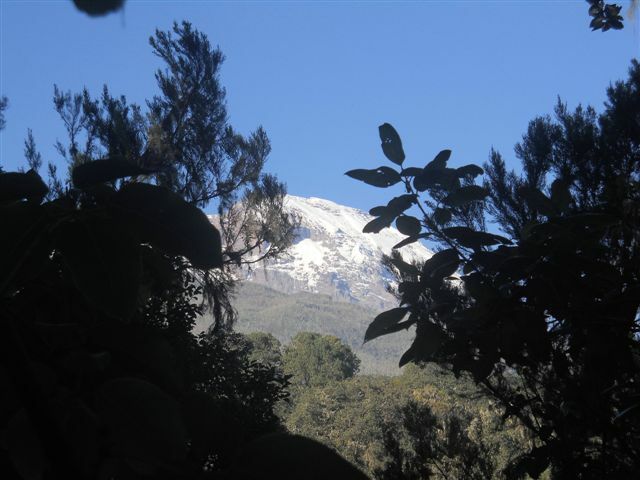 I love these two pics below that the boys took, it’s captured the moment I first viewed the part of the summit from the slopes of Kilimanjaro herself. 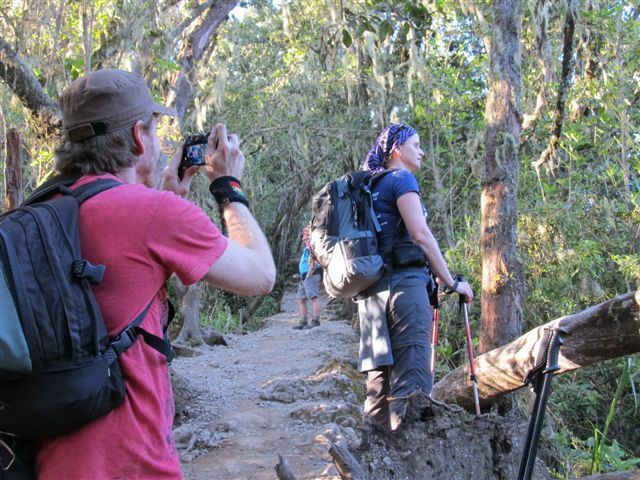 I didn’t even know these photos were taken until I got back from my holiday and saw them ~ Simon taking a picture of me as I stood there totally mesmerised by the view that unfolded before me (note to self: I must work on a better ‘mesmerised’ look!) and then Anthony capturing Simon taking the photo of me. That’s what I love most about photographs, they capture moments in time, some long forgotten until you pull that photo out. What you have caught on film is captured forever . . . it remembers little things, long after you have forgotten everything. It was unforgettable moments – sneaking up unexpectedly like this – that just took my breath away. From here our walking slowed even more as the path began to rise steeply. 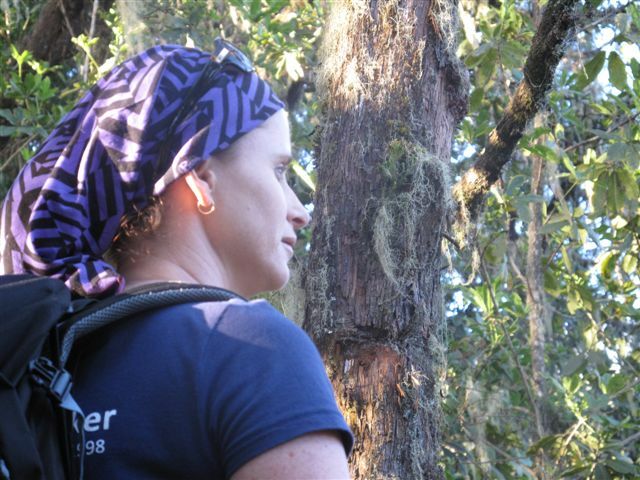 I noticed the difference in my breathing and with each step I would find myself breathing deeper, trying to take in more air as we continued to climb steeply up towards our campsite for the night. Not too much later and I noticed the scenery around us was changing, the forest was thinning out and Thomas said camp was close. 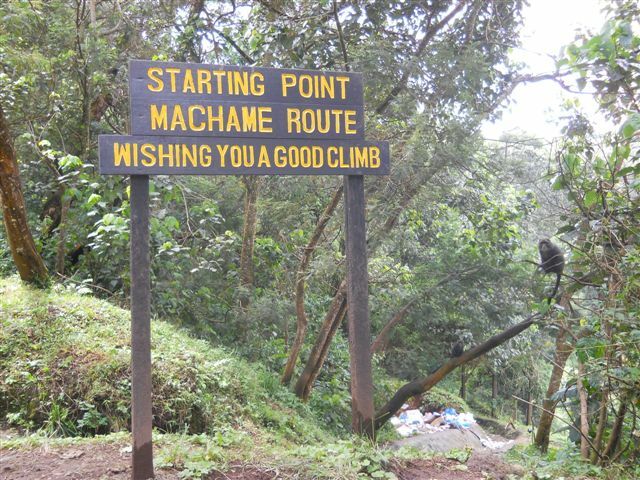 The Machame Camp, situated just below the tree line around 3015m. 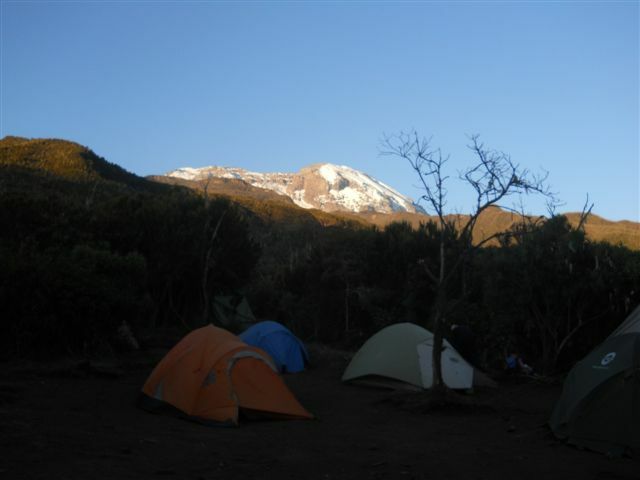 Here, at the base of the Kilimanjaro, we would spend the night. 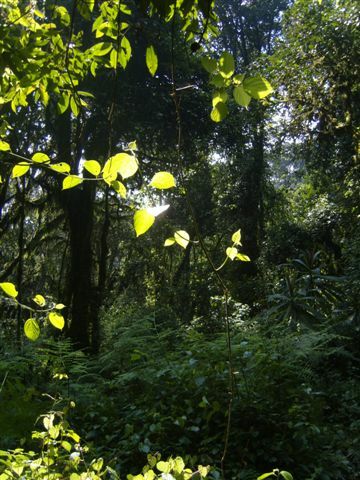 The rainforest was ending and the scenery was changing. Our campsite was near. 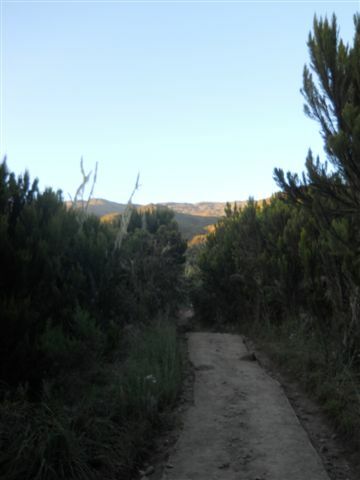 At around 5:30pm that afternoon, we strolled into camp. The view from our campsite. No matter how many times we saw this sight, we would still turn back and look yet again! 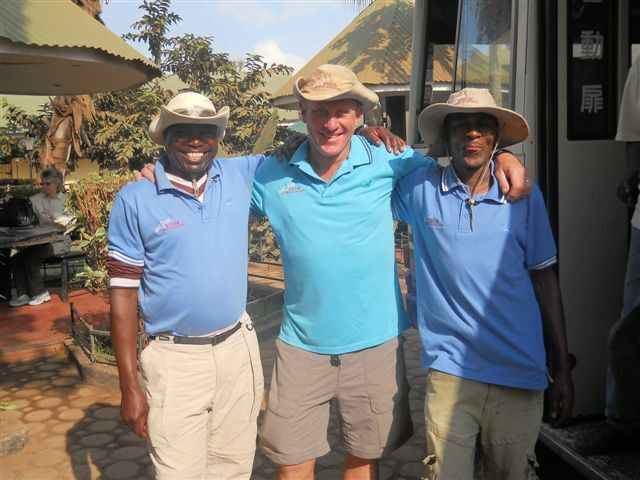 Simon and Anthony, our unexpected team members! Anthony, I promise it was not planned to blot you out with the tree, Aussie or not!! 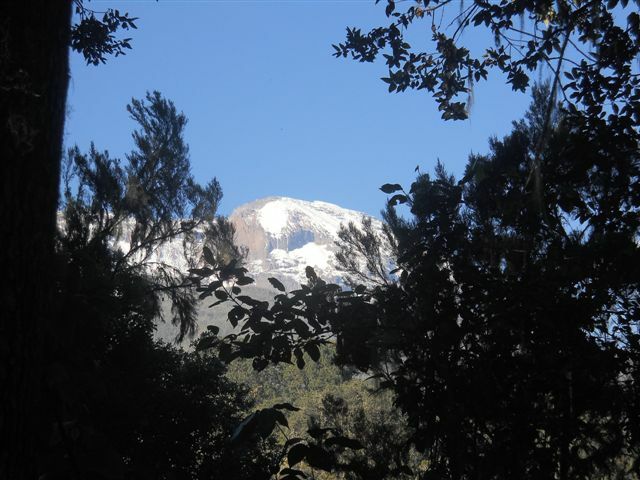 The view from camp was beautiful and we arrived to a camp fully set up already by our porters and all we had to do was pick a tent! Donna and I shared a tent, Thomas and Anthony took another, Judi and Simon were paired up and Barry and Sean in another. We were yet again blessed with magnificent views of the summit. 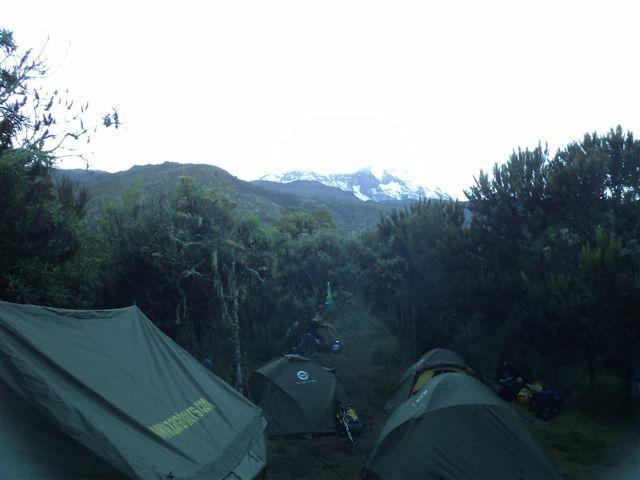 Apparently, this camp site is usually shrouded in mist and low-lying cloud, hiding the summit from view. We didn’t expect anything less, after all Donna and I had informed Thomas on numerous occasions our weather would be perfect on our trip. So far, we were right! 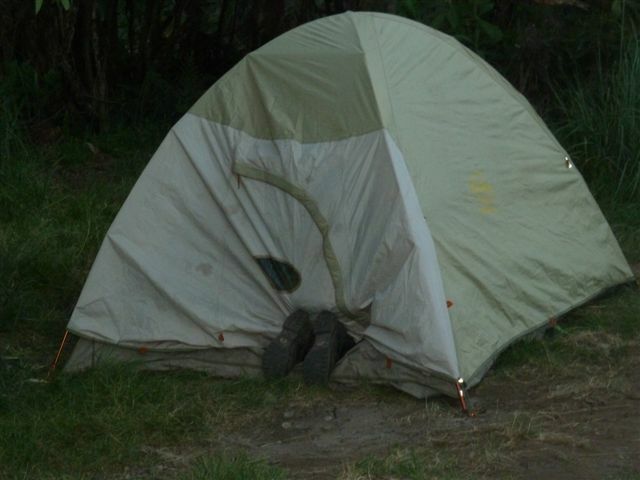 Another sight we were happy to see at our camp site, was our toilet! You see each camp on the mountain has long drops, the kind where you have to make your quad muscles work hard to balance you. 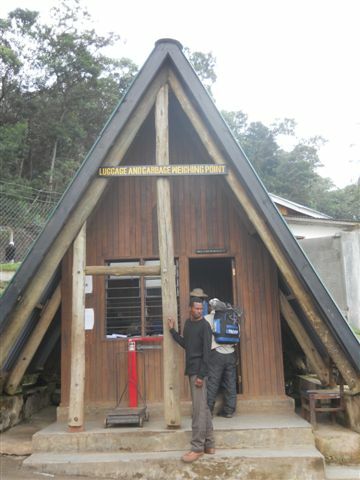 Luckily, we had our own porter-loo! 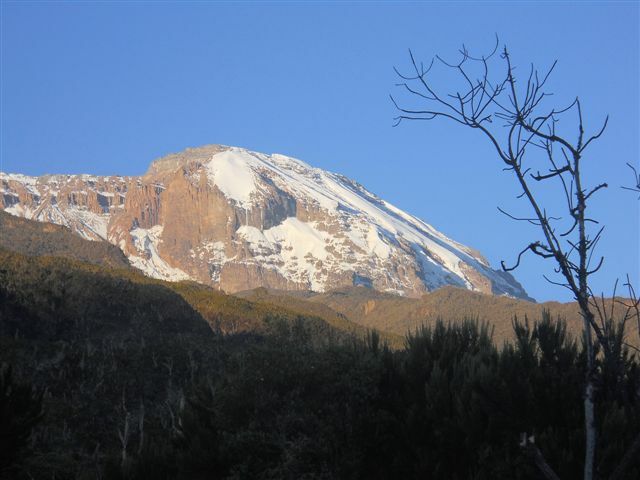 When you catch a glimpse of those long-drops of the mountain, you too would count your lucky stars if you had your own private toilet ~ one that was like a thrown in comparison! The sun was beginning to set on our first day on the mountain. Gathering in the mess tent we were served by our waiter, Hilary. 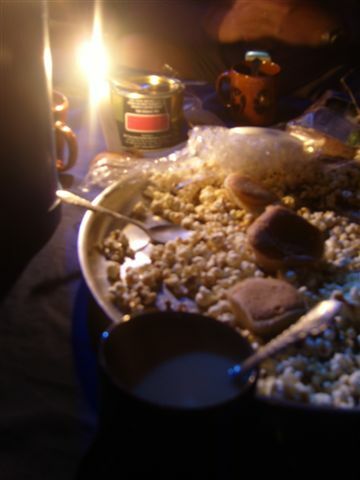 Popcorn to nibble on and tea and coffee to drink. This was followed by soup for starters before been served a full meal that filled our tummies to the brim. Sitting by candle light, we chatted getting to know one another some more. 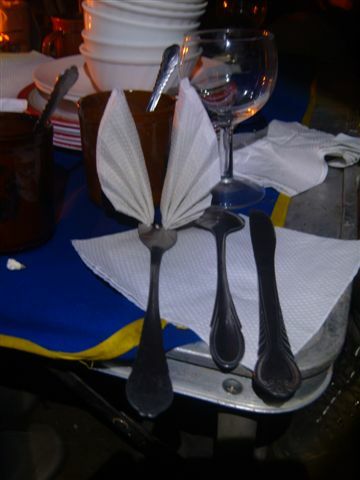 Every evening we would gather in the mess tent to find a beautiful set table for us by our waiter Hilary. Eventually, tummies full we retired to our tents. Donna and I sorted our stuff for the morning. Not that it would really matter. How is it that in such a small space you still lose things? As I climbed into my sleeping bag I pulled out an email & some other messages I had printed from my best friend & Emma’s sister, amongst others. It was crazy before I left and I hadn’t had time to read them properly and tonight, finally finding some quite time, the short messages were to be my bed-time reading. Nearly time to fly! It seemed some time ago in the future when you first started writing your blog. It’s made me laugh & cry, but overall has amazed me with your wonderful positivity & zest for life. Love you loads and loads and so EXTREMELY, INFINTESSIMALLY PROUD OF YOU and all you are hoping to accomplish. Come back in one piece! 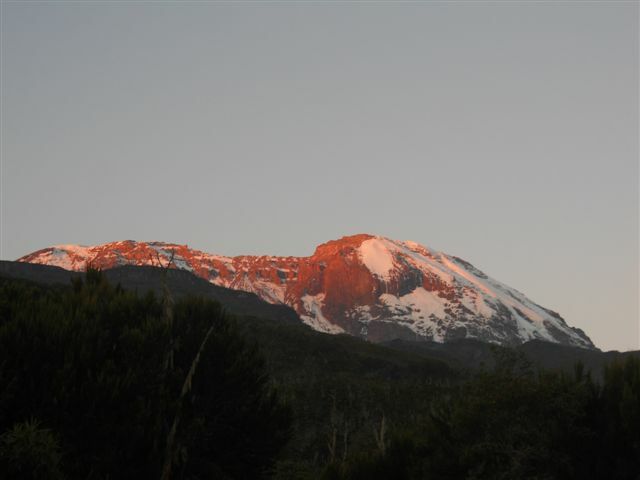 Tonight, we were sleeping on the slopes of Kilimanjaro. I think I asked Donna to pinch me. I fell asleep thinking of all my loved one’s back home. Grateful for all the love and support. I breathed deeply & closed my eyes.